We haven't been on a family vacation this year. Actually, we haven't been on a family vacation en masse since Jasper was born, which really needs to be rectified soon since he's already two. One of the reasons we haven't has been money, sure, but it's also because it's so hard to find vacation options that truly offer something for everyone in the family and aren't just a giant tourist trap. What to do if your family wants to experience nature and luxury simultaneously? Vail Resorts has created Epic Summer as an antidote to pedestrian family vacations. 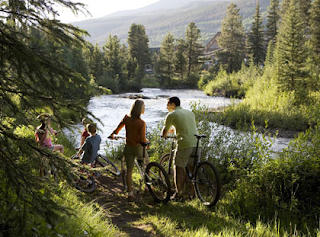 The all-inclusive packages allow your family to experience the scenic outdoor adventureland that is Colorado, with pre-planned itineraries for four or seven day trips. Pre-planned vacation tours aren't just for black sock-wearing octogenarians anymore. Epic Summer tours pack in horseback riding, hiking, rafting and picnicking with historical tours and fine dining. Each tour is led by an experienced guide who will transport you to your destination and give you the local's lay of the land. 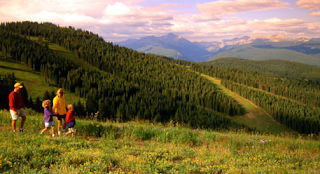 Activity locations include popular destinations such as Vail, Breckenridge, Beaver Creek, Keystone and Rocky Mountain National Park. I've only seen these towns covered in snow so I can only imagine what they look like blanketed in wildflowers! I love Vail! I have only been in the winter, I used to ski there often. It is gorgeous! I've never been to Vail, but need to do it one day. We have some skiing here, but it's pretty pathetic...more ice than powder.